The BROOKLYN NINE-NINE cast just went back to work, but season 6 is already starting to take shape. 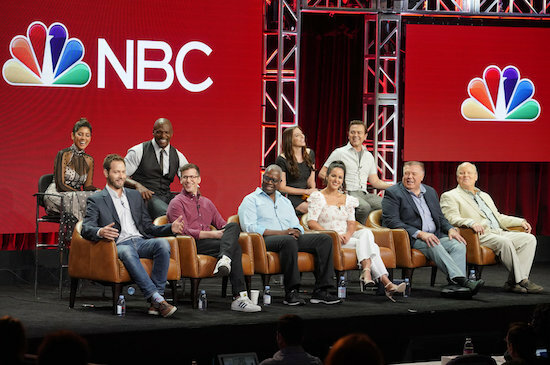 Though the comedy’s return (it’ll be a part of NBC’s midseason lineup) is still very much TBD, the first episode will pick up pretty close after Jake (Andy Samberg) and Amy’s (Melissa Fumero) wedding. The duo will have a honeymoon—executive producer Dan Goor was coy about details, except for that it wouldn’t be at the precinct—but a jump could be ahead after that point. Halloween, in particular, has played an important part in the BROOKLYN NINE-NINE, as the precinct gets caught up in their annual heist competition. “They’re some of our favorite episodes to watch, and they’re some of the hardest ones also to write because of the twists and turns and everything,“ Goor admitted during the panel. What are you hoping to see in BROOKLYN NINE-NINE season 6?